Once a novelty item in the office space industry, coworking is becoming a saturated market that will soon emerge with innovate leaders and trailblazers. In an era where remote work is quickly becoming the norm, it’s not surprising that coworking spaces are sprouting up all over the world to accommodate the shift. However, there will be a time when the coworker/coworking supply and demand stabilizes, making it important to stand out in the industry. Founded by Lucas Seyhun, The Farm has set out to be a key player in the digital nomad revolution. We were able to chat with Lucas about the newest Farm location opening, the unique factors of the space, and the future of the coworking lifestyle. Congrats on the new location. What brought The Farm to the Nomad neighborhood in NYC? Nomad as a neighborhood is in its way of becoming the epicenter of startup culture in New York. The neighborhood is changing at a rapid rate and will continuously evolve within the next few months. Our space is strategically located in the center of it all, located in the crossroads of 28th and Broadway, wedged between the Nomad and Ace hotels, Farm Nomad becomes a central location for today's Digital Nomad. What sets this location apart from Soho? 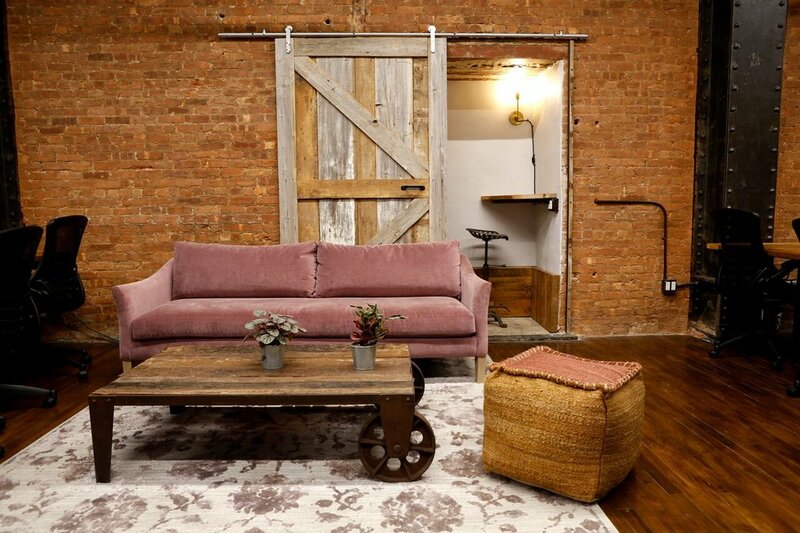 We used a bit more rustic design here at the Nomad location and we also added a bit more soft seating. We are witnessing a shift in demand from the traditional chairs and tables to a homey environment from our clients. How would you describe The Farm’s community overall? Farm community consists of mainly early-stage startups who are looking to change the world through their venture. We also cater to digital nomads or solo-prenuers if you may. We come to find that our solo members are the social butterflies that give the community its essence. Are there any happy hours or community events that stood out to you this year? We love our lunch and learns YUM! it is the best of both worlds, grab some grub, learn about a new CRM and meet a new friend or even you new CTO. What do you think draws people to The Farm? We offer the sense of belonging, homey design, vibrant community, and, to top it all off, its affordability. The Farm has identified as an affordable solution for someone who is looking for a space that is wedged between a nice hotel lobby, coffee shop and the traditional working. How has coworking changed since you started the first location to now? Coworking is nowadays is witnessing a homogeneous model. Most of the competition ia starting to look more alike in terms of, services, design etc... It is getting harder to separate the big brands from each other. When we began coworking it was a movement to revolutionize work, rather than a wallpapered version of executive suites business with a ping pong table in its lobby. Where do you see coworking going in the next few years? We will see more players coming into the market. Thankfully, we still have a surge in demand from new clients, eventually, the demand and supply will stabilize, at that point we will only start seeing providers who have established themselves as a unique brand along with lean operations will stay relevant. I also anticipate that more commercial real-estate players start offering coworking lounges within their buildings as an amenity to stay relevant, just as a high-end condo offers a pool and a lounge to its tenants.